A vise is a mechanical apparatus used to secure an object to allow work to be performed on it. Vises have two parallel jaws, one fixed and the other movable, threaded in and out by a screw and lever. An engineer’s vise is bolted onto the top surface of a workbench, with the face of the fixed jaws just forward of its front edge. The vise may include other features such as a small anvil on the back of its body. Most engineer’s vises have a swivel base. Some engineer’s vises marketed as “Homeowner Grade” are not made of steel or cast iron, but of pot metal. Machine vises are mounted on drill presses, grinding machines and milling machines. Abrasive chop saws have a special type of machine vise built in to the saw. Some hobbyists use a machine vise as a bench vise because of the low cost and small size. compound slide vises are more complex machine vises. They allow speed and precision in the placement of the work. Cross vises, which can be adjusted using leadscrews in the X and Y axes; these are useful if many holes need to be drilled in the same workpiece using a drill press. Compare router table. 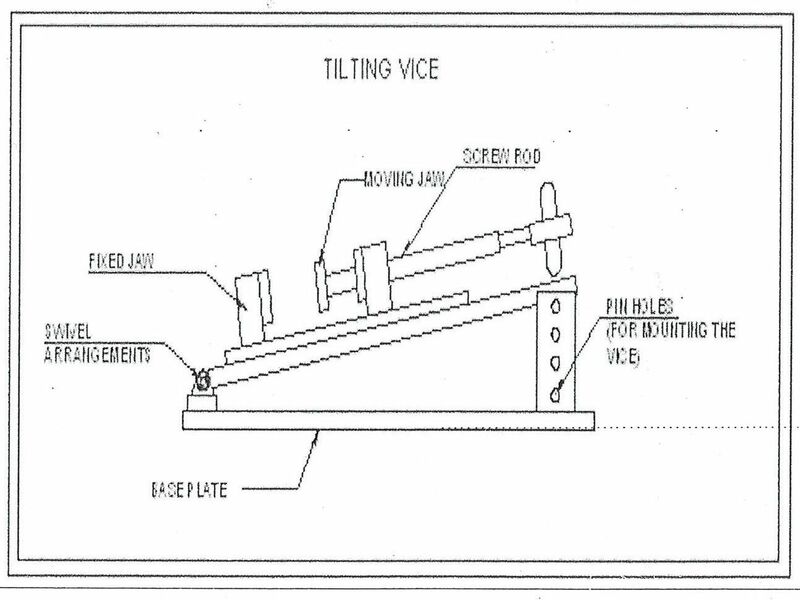 What Is Angle Or Tilting Vice? An angle vice, also known as a tilting vice, is a machine vice that can tilt to set a clamped workpiece up at an angle for machining. Its key feature is that the main body of the vice can be adjusted up to a 90 degree angle, while the base remains stationary on the machine’s table. This tilt allows the user to place the workpiece in the most convenient position for tasks including drilling, reaming or milling. Jaws: A machine vice usually has hardened jaws which allow it to withstand the large amount of force that comes with machining applications. Screw :The screw is the part that is in control of opening and closing the jaws of the vice. Handle: machine vice commonly has a small crank handle which allows the user to apply maximum clamping force when working, but without having to turn the handle excessively. This is because the crank handle provides extra leverage when rotating, meaning the screw can exert greater pressure onto the jaws but without any extra effort from the user. Base : Machine vices are often manufactured with a flat bottom base design which fits firmly against the machine’s table. This allows the vice to fit on the table in horizontal alignment with the drill bit. Swivel arrangement : Spherical or Rolling pair is needed to tilt both jaws in desired angle .Fixed jaw has provided the swiveling attachment to tilt it without any extra effort. Locking Pins: Once desired angle is achieved movable jaw is fixed with help of locking Pins. As an angle vice can be used to hold a workpiece for a number of tasks, including drilling and milling, the vice can therefore be used in both drill press and milling machines. The tilting feature means the vice is ideal for creating angled or diagonal holes through an object when drilling. It is also useful for milling applications, such as making dovetail joints, as the vice can be set to any desired angle, up to 90 degrees.